I want my Christmas mantel to be decorated in traditional colors of Christmas. I purchased new large canvas wall art of the prettiest picture of Santa that I have ever seen. I used a garland to lay across the mantel and I knitted a Christmas Tree Banner to drape across the fireplace mantel. I want to thank the super talented Chloe from Celebrate & Decorate for organizing and hosting this Christmas Blog Hop. I am so excited to be included with all of these talented bloggers. I love all the neutral muted colors for Christmas décor and I love all of the metallic colored décor but for me, I want to use traditional colors of red, white, green, and cream colors in my home. When people tell me that they do not know what colors to use in their homes, I say go with the things and the colors in the stores that you are drawn to. When I pass by a shop or store with bright red and green décor in the windows, I find myself wanting to go in and look. I know that these colors make me smile. I think it goes back to what colors my mother used in her home and the colors that she still uses today. It’s funny how as I get older, I want to reminisce of Christmases with my family as a child. Talk about me being drawn to something, when I saw this huge Santa on Canvas at Hobby Lobby, I had to have it! I do not purchase new décor every year and I have not purchased much new décor in several years so I justified this purchase and I am so glad I did. My family loves this picture and I can’t see us ever getting tired of it. I used my garland that I have had for many years and added some thrifted brass candlesticks to each side. I am also loving all of the vintage décor and also the vintage hobbies are coming back. I see younger people learning to embroidery, macramé, crochet, and knitting. I thought I would knit a banner to add to my mantel. I tweaked some patterns that I found for Christmas trees and by using larger yarn and knitting needles, they became large enough for a banner. This Christmas Tree Banner is so quick and easy to knit. You can view the pattern and tutorial on this post. You do not have to use the trees only on a banner. 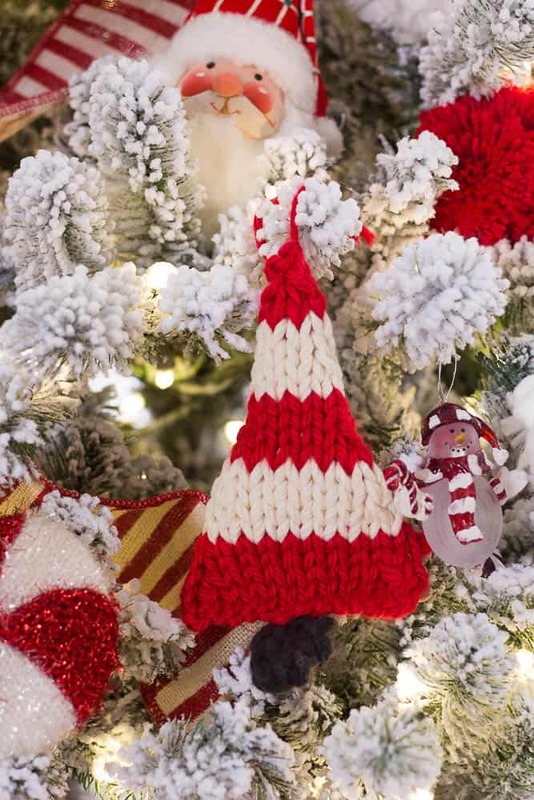 The knitted trees can also be used as tree ornaments. They are large enough to fill the empty spaces in the trees. Shiny balls in lanterns are some of my favorite ways to decorate and I think they look pretty sitting on the fireplace. These lanterns are 24 inches high and 28 inches high. I used a wire basket to store our Christmas throws in. I will remove the banner and add our stocking right before Christmas so that Santa can fill them! 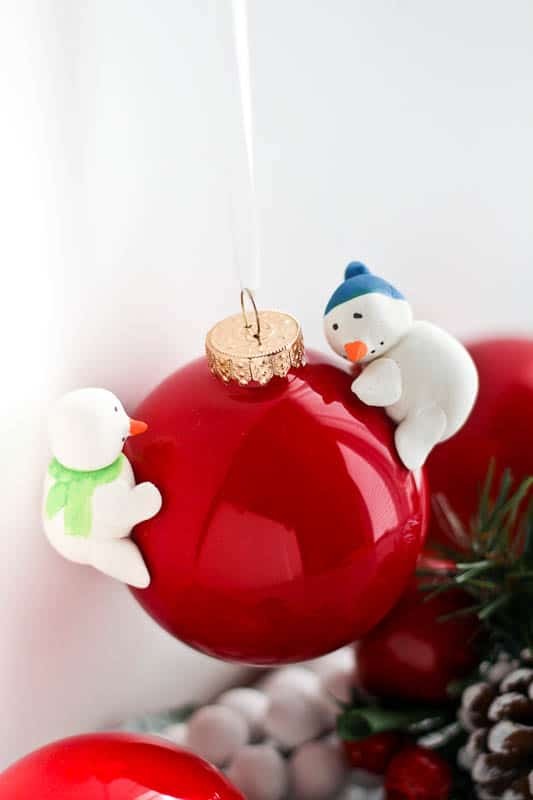 I hope you have found some Christmas décor ideas in this Christmas Blog Hop. Don’t forget to check out all of the other blogger’s Christmas décor! That Santa portrait is fabulous!! What a wonderful fireplace display!! The Santa is fabulous! I bet no one misbehaves at your house, Santa is definitely watching! 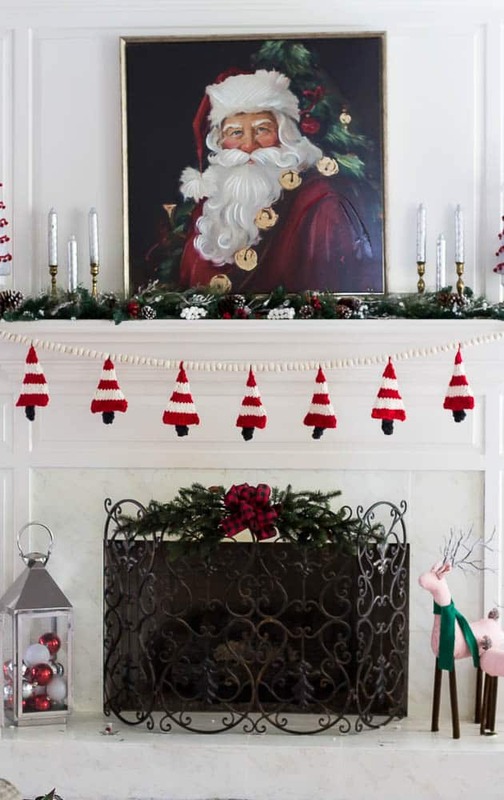 I love the way you explained why to use colors you love~ and the candy cane stripe knit garland is just adorable and looks grand with the Santa! Sherry, I am in L♥VE with your holiday mantel! I, too, am totally drawn to the traditional red, white, green, cream (and black accents) for Christmas. Your knitted garland is fabulous! DId you felt the strand of pom poms too or purchase and tie on the trees? That’s just gorgeous. The fabric ornaments are my favorite kind of ornaments on the tree – so much easier to store than the glass or mercury balls. Your Santa is reminiscent of the Santa from most everyone’s childhood, I suspect. He is quite handsome as the focal point on your mantel. I love using what I have, adding vintage, and an occasional new item. Your Christmas mantel makes me smile with delight – well done! What a beautiful home you have! Your fireplace is exquisite! The knitted trees are so striking and creative. 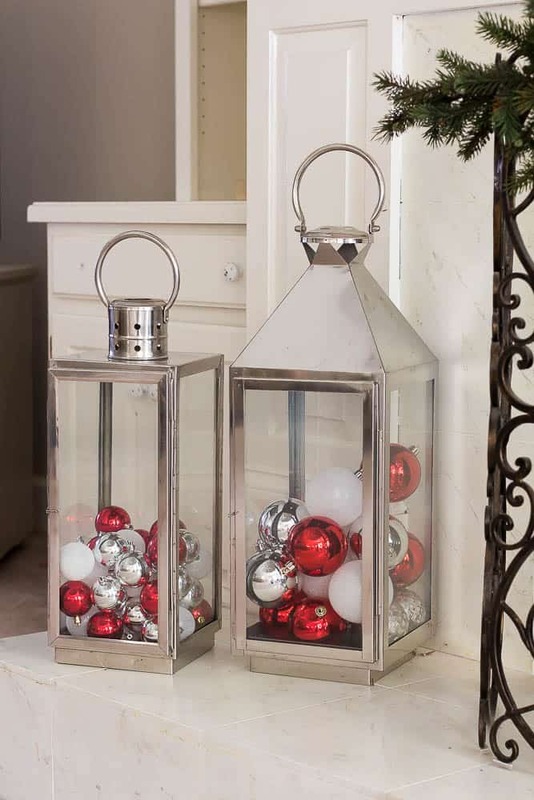 Those lanterns filled with red and white Christmas balls are also eye catching. Balancing them with a wire basket filled with Christmas throws looks fabulous. The plaid bow on the fire screen finishes your look nicely. The lanterns are striking and I love the home made touches. Nostalgia happens as we age doesn’t it? I can see why you fell in love with that Santa picture. It is spectacular. Your holiday mantel looks so good. I am with ya…still love the traditional greens and reds in my home. They remind me of my childhood and truly remind me of christmas. 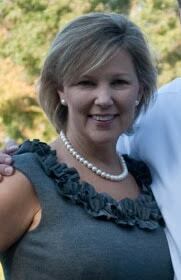 Sherry, i love how you decorated your mantle. I’m showing mine tomorrow. You won’t believe how similar our mantles and fireplaces are ~ without any decorations. Love the big Santa picture. Such a statement piece. Happy to be on this blog hop with you. Sherry, your home is decorated so lovely for Christmas! I can see why your were drawn to that gorgeous painting of Santa. There is no doubt he is watching closely what is doing on in your home! He is certainly my favorite element in your decor! 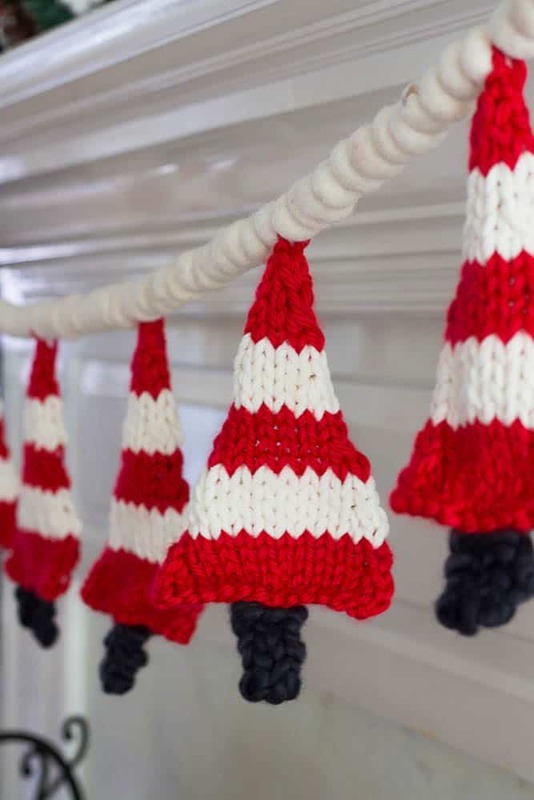 That little handmade garland of red and white Christmas trees is just adorable! Someday I just might learn to knit or crochet! (not likely)! I envy those of you with that talent! Thank you so much for being part of another blog hop! Merry Christmas! 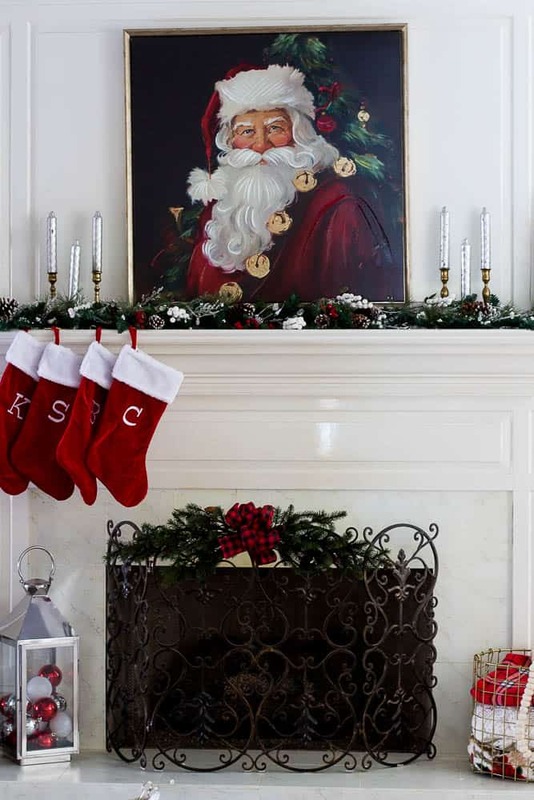 The crisp white-ness of your fireplace is the perfect backdrop for that gorgeous Santa picture – I just love everything about that pic – no wonder you had to have it. You’ve decorated beautifully around it with the garland, the candlesticks and the cute knit tree banner you made – they all accent the pic and don’t distract from it. Those silver lanterns on your hearth are terrific and I’ve had my eye out for a wire basket like the one you have your throws in for awhile now. I’m going back to do some pinning now! I really enjoyed my stop here on the Blog Hop! I have to agree that is one of the prettiest Santa pictures I have ever seen. Your mantel looks absolutely beautiful, and I love your fireplace screen. I have been looking for one like that. It has been so much fun blog hopping with you. I hope have a wonderful holiday season!